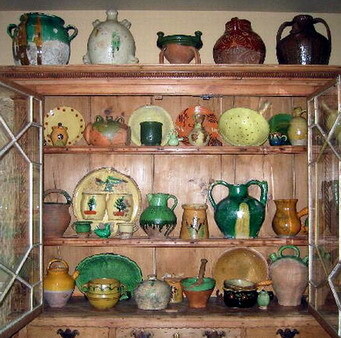 Examples of Collections found throughout the Country created by J&V and the Private Collector/Client. This has perhaps been the longest and most impressive collaboration between a true lover de l'art de Terres Vernissées and J&V with the result being one of the finest Collections of Museum Quality in the Chicago Metro Region. Pieces run the gamut from an 18thC primitive Epi de Faitage from SaintOnge to the rarest Poterie to be created in Languedoc, la Cruche de Barque. J&V would like to acknowledge our prize Collectors for taking the time to provide us with photos of the stunning results of our work together.